NJB Article and Source Repository: Sean Hannity’s Veneration of Ignorance. By Bret Stephens. Sean Hannity’s Veneration of Ignorance. By Bret Stephens. Sean Hannity’s Veneration of Ignorance. By Bret Stephens. Wall Street Journal, August 8, 2016. The right’s political huckster gives Al Sharpton a run for his money. It was probably inevitable that Donald Trump and his media munchkins would alight on the stab-in-the-back theory to explain his probable defeat in November. The surprise is that they are doing so with the election still three months out. 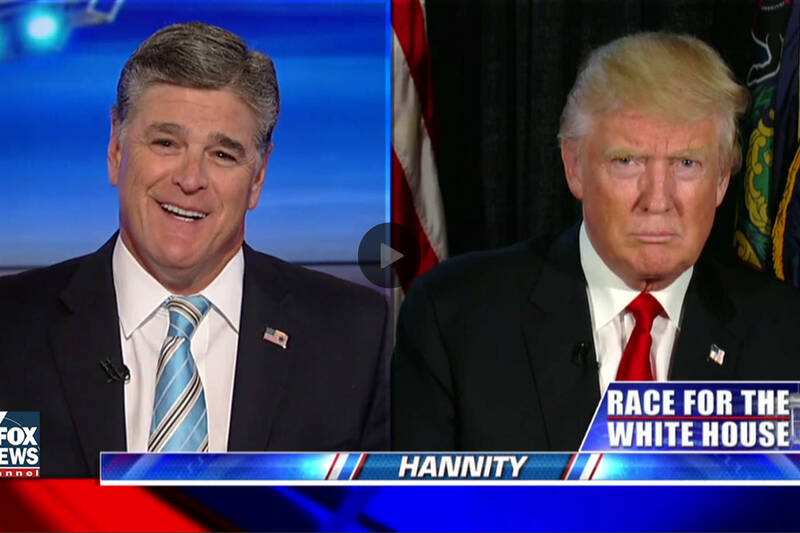 Mr. Hannity has never made a secret of his feelings for Mr. Trump, which is the love that dares to speak its name. But his comments were also a revelation, and not just that it has dawned on him that the Republican nominee is likely to lose and lose big. Like members of a cult who discover too late that their self-proclaimed messiah is mortal after all, rationalizations are required. Mr. Trump has lately been road-testing one such rationalization, saying the election will be “rigged.” Voter fraud is a reality in American elections, but it is typical of the candidate to confuse anecdote with data and turn allegation into conspiracy. Mr. Trump also says the media is “rigged” against him, which is amusing coming from the beneficiary of the equivalent of $3 billion in free advertising. This is the reason I’ve consistently argued that the only hope for a conservative restoration is a blowout Hillary Clinton victory, held in check by a Republican majority in Congress. If Mr. Trump loses the election narrowly, the stab-in-the-back thesis will have a patina of credibility that he might have won had it not been for the opposition of people like me. But a McGovern-style defeat makes that argument impossible to sustain except among the most cretinous. We can count on Mr. Hannity for that. Last week, I appeared on Fareed Zakaria’s CNN show opposite a Trump supporter named Emily Miller. At the end of the show, I said Americans deserve a president who can speak grammatical English. Ms. Miller retorted that it was “snobby” of me to say so. There was a time when the conservative movement was led by the likes of Bill Buckley and Irving Kristol and Bob Bartley, men of ideas who invested the Republican Party with intellectual seriousness. Today’s GOP is on the road to self-immolation, thanks in part to the veneration of ignorance typified by Ms. Miller and Mr. Hannity. As conservatives go through their pre- and post-mortems, they should think about the damage that such veneration can do.